Pakistan police officers fire tear gas shell to disperse Shi'ite Muslims during an anti-U.S rally, when they tried to march toward the U.S. consulate, in Karachi, Pakistan, Aug. 27, 2017. Pakistan says it seeks to amicably resolve issues with the United States, cautioning “any [coercive] American action” would cause instability in the country. The remarks by Defense Minister Khurram Dastgir Khan came days after U.S. President Donald Trump singled out Pakistan for harboring terrorist organizations, including the Taliban and Haqqani network, which destabilize Afghanistan and plot attacks on American troops there. Trump did not outline what actions he might order to pressure Islamabad to move against the alleged terrorist sanctuaries. A range of punitive measures reportedly is being considered, though, such as increasing diplomatic and economic pressure, and intensifying and expanding anti-terrorism drone strikes inside Pakistan. Pakistani protesters burn posters of U. S. President Donald Trump in Peshawar, Pakistan, Aug. 30, 2017. Protesters have objected to Trump's allegation that Islamabad is harboring militants who battle U.S. forces in Afghanistan. Speaking to reporters Tuesday in Islamabad, Defense Minister Khan again rejected that there are any terrorist sanctuaries in Pakistan. He said Pakistani security forces already have taken action against all terrorist groups and are in the process of eliminating their “remnants” in the country. Minister Khan also cited U.S. military assessments that say less then 60 percent of Afghan territory is under the control or influence of the Kabul government. “That is why we are all gravely concerned about the fact that 40 percent of Afghanistan has perhaps become a safe haven [for terrorists],” he said. The Pakistani minister added that his country is not feeling threatened by the U.S. following the harshly worded Trump speech. “However, we are maintaining an extremely strict monitoring of our land, sea and air frontiers,” noted Khan. He sounded upbeat, though, about “better and quality future engagements" between Islamabad and Washington. Khan said the Pakistani foreign minister, Khawaja Muham­mad Asif, plans to travel to Washington for official talks after consulting key regional partners, including China, Russia, Iran and Turkey. “We are trying to resolve the issues amicably because any American action would cause instability in Pakistan,” the defense minister warned. On Monday, China, and the four other countries that comprise the BRICS group of major emerging economies — India, Russia, Brazil and South Africa — agreed to boost cooperation against terrorist organizations threatening the region. A statement issued after a BRICS’ leaders’ summit hosted by China contained the names of Pakistan-based, Lashkar-e-Taiba and Jaish-e-Mohammad militant groups blamed for orchestrating attacks against India. Pakistani authorities already have outlawed the organizations. 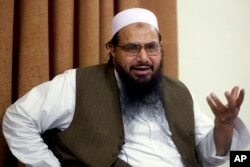 FILE - In this April 3, 2012, Hafiz Mohammed Saeed, chief of Jamaat-ud-Dawwa and founder of Lashkar-e-Taiba, talks with the Associated Press in Islamabad, Pakistan. Responding to the BRICS’ announcement, Pakistan's Foreign Ministry said it also is concerned about the threat posed by terrorism and extremism in South Asia. In a brief statement, the ministry pointed to the presence of terrorist groups in “the ungoverned spaces of Afghanistan,” including the Pakistani Taliban and its associates like Jamaatul Ahrar, Islamic State and anti-China militants. “Pakistan also remains concerned at the rise of extremist ideologies and intolerance in the region encouraging social stratification and systematic targeting of minorities,” the statement reads. Islamabad alleges that India is partnering with the Afghan intelligence agency to support anti-state militants sheltering in Afghanistan to plan attacks against Pakistan, charges Kabul and New Delhi reject. How Will US Tackle Safe Havens in Pakistan?